Automatic operation The automatic climate control system is controlled by simply setting the desired temperature. The Full Automatic Temperature Control (FATC) system automatically controls the heating and cooling system as follows; 1. Push the AUTO button. It is indicated by AUTO on the display. The modes, fan speeds, air intake and air-conditioning will be controlled automatically by temperature setting. 2. Turn the TEMP knob to set the desired temperature. If the temperature is set to the lowest setting (Lo), the air conditioning system will operate continuously. 3. To turn the automatic operation off, press any button or turn any knob except temperature control knob. If you press the mode selection button, air-conditioning button, defrost button, air intake control button or fan speed knob, the selected function will be controlled manually while other functions operate automatically. Regardless of the temperature setting, when using automatic operation, the air conditioning system will automatically turn on to decrease the humidity inside the vehicle, even if the temperature is set to warm. NOTICE Never place anything over the sensor located on the instrument panel to ensure better control of the heating and cooling system. Manual operation The heating and cooling system can be controlled manually as well by pushing buttons other than the AUTO button. In this case, the system works sequentially according to the order of buttons selected. When pressing any button except AUTO button while automatic operation, the functions of the buttons not selected will be controlled automatically. Press the AUTO button in order to convert to full automatic control of the system. Temperature control knob The temperature will increase to the maximum HI by turning the knob to the right extremely. The temperature will decrease to the minimum Lo by turning the knob to the left extremely. When turning the knob, the temperature will increase or decrease by 0.5°C/1°F. When set to the lowest temperature setting, the air conditioning will operate continuously. Temperature conversion If the battery has been discharged or disconnected, the temperature mode will reset to display in Fahrenheit degrees. This is a normal system operation and you can switch the temperature switch to display Fahrenheit to Centigrade as follows: While depressing the AUTO button, depress the OFF button for 3 seconds or more. The display will change from Centigrade to Fahrenheit, or from Fahrenheit to Centigrade. Fan speed control knob The fan speed can be set to the desired speed by turning the fan speed control knob. The higher the fan speed is, the more air is delivered. Pressing the OFF button turns off the fan. Air intake control button This is used to select outside (fresh) air position or recirculated air position. To change the air intake control position, push the control button. Recirculated air position With the recirculated air position selected, air from passenger compartment will be drawn through the heating system and heated or cooled according to the function selected. 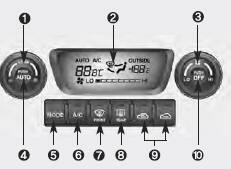 Outside (fresh) air position With the outside (fresh) air position selected, air enters the vehicle from outside and is heated or cooled according to the function selected. It should be noted that prolonged operation of the heating in recirculated air position will cause fogging of the windshield and side windows and the air within the passenger compartment will become stale. In addition, prolonged use of the air conditioning with the “recirculated air position” selected, will result in excessively dry air in the passenger compartment. WARNING - Recirculated air • Continued climate control system operation in the recirculated air position may allow humidity to increase inside vehicle which may fog the glass and obscure visibility. • Continued climate control system operation in the recirculated air position can result in somewhat reduced oxygen levels, causing drowsiness or sleepiness, and loss of vehicle control. Set the air intake control to the outside (fresh) air position as much as possible while driving. Instrument panel vents If air flow control is not satisfactory, check the instrument panel vents. The outlet port ( ) can be opened or closed separately using the horizontal thumbwheel. To close the vent, rotate it left to the maximum position. To open the vent, rotate it right to the desired position. Also, you can adjust the direction of air delivery from these vents using the vent control lever as shown. Air conditioning button Push the A/C button to turn the air conditioning system on (indicator light will illuminate). Push the button again to turn the air conditioning system off. OFF button Push the OFF button to turn off the air climate control system. However you can still operate the mode and air intake buttons as long as the ignition switch is ON. Outside tempmeter The current outer temperature is displayed in 1°C (2°F) where the temperature range is between -40°C ~ 60°C (-40°F~140°F). Press and hold the OFF and AUTO buttons simultaneously for about 3~5 seconds to change the display from Celsius to Fahrenheit. Repeat the procedure to switch the outside temperature display back to the previous state. System operation Ventilation 1. Set the mode to the position. 2. Set the air intake control to the outside (fresh) air position. 3. Set the temperature control to the desired position. 4. Set the fan speed control to the desired speed. Heating 1. Set the mode to the position. 2. Set the air intake control to the outside (fresh) air position. 3. Set the temperature control to the desired position. 4. Set the fan speed control to the desired speed. 5. If dehumidified heating is desired, turn the air conditioning system on. • If cool air is desired at face level for bi-level operation, set the mode to the position. • If the windshield fogs up, set the mode to the , position. Air conditioning All Kia Air Conditioning Systems are filled with environmentally friendly R-134a refrigerant which is not damaging to the ozone layer. 1. Start the engine. Push the air conditioning button. 2. Set the mode to the position. 3. Set the air intake control to the outside air or recirculated air position. 4. Set the temperature control to the desired position. 5. Set the fan speed control to the desired speed. 6. Adjust the fan speed control and temperature control to maintain maximum comfort. • If warmer air is desired at floor level for bi-level operation, set the mode to the position and adjust the temperature control to maintain maximum comfort. • When maximum cooling is desired, set the temperature control to the minimum (Lo) and set the air intake to the recirculated air position, then set the fan speed control to the highest speed. NOTICE When using the air conditioning system, monitor the temperature gauge closely while driving up hills or in heavy traffic when outside temperatures are high. Air conditioning system operation may cause engine overheating. Continue to use the blower fan but turn the air conditioning system off if the temperature gauge indicates engine overheating. Air conditioning system operation tips • If the vehicle has been parked in direct sunlight during hot weather, open the windows for a short time to let the hot air inside the vehicle escape. • To help reduce moisture inside of windows on rainy humid days, decrease the humidity inside the vehicle by operating the air conditioning system. • During air conditioning system operation, you may occasionally notice a slight change in engine speed at idle as the air conditioning compressor cycles on. This is a normal system operating characteristic. • Use the air conditioning system every month if only for a few minutes to ensure maximum system performance. • When using the air conditioning system, you may notice clear water dripping (or even pudding) on the ground under the passenger side of the vehicle. This is a normal system operating characteristic. • The air conditioning system includes a function that automatically turns the air conditioning compressor off if engine coolant temperature approaches an over heating level. The air conditioning compressor operation will resume once engine coolant temperature returns to the normal range. Also, the air conditioning compressor is automatically turned off for a few seconds when the accelerator is fully depressed (wide open throttle). • When operating the air conditioning system use the outside (fresh) air position. • Operating the air conditioning system in the recirculated air position does provide maximum cooling, however, continual operation in this mode may cause the air inside the vehicle to become stale. Checking the amount of air conditioner refrigerant and compressor lubricant When the amount of refrigerant is low, the performance of the air conditioning is reduced. Overfilling also has a bad influence on the air conditioning system. Therefore, if abnormal operation is found, have the system inspected by an authorized Kia dealer. CAUTION The air conditioner refrigerant container is highly pressurized. Therefore it should be serviced by an authorized Kia dealer. Improper service may cause serious injury. NOTICE When the performance of the air conditioning system is reduced it is important that the correct type and amount of oil and refrigerant is used. Otherwise, damage to the compressor and abnormal system operation may occur.